We are proud to announce the following demonstrators for the Desert Woodturning Roundup 2016. Glenn Lucas has an international reputation for his proficiency at the lathe and his ability to pass on to students, the skills and knowledge he has gained. 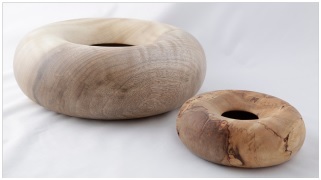 He balances his production of classic bowls turned from native Irish wood (set up in 1995), with an extensive teaching programme run from his Co Carlow ‘Woodturning Study Centre’ (since 2005). A frequent guest Demonstrator at overseas conferences, he also gives Turning Masterclasses at international arts and crafts schools. 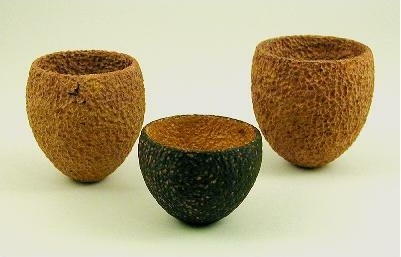 In October 2010 he produced the first Irish woodturning DVD ‘Mastering Woodturning -- Tools and Techniques’ and in June 2011 launched ‘Mastering Woodturning -- Bowl Turning Techniques’. 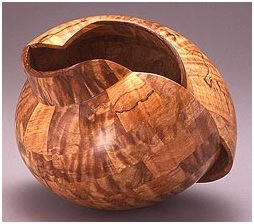 In November 2014 'Mastering Woodturning -- Sharpening Techniques' was added to the series. All the DVDs have been favourably reviewed and are stocked by outlets worldwide. 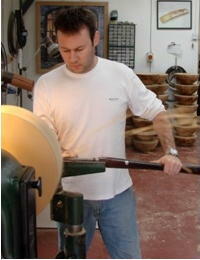 In May 2013 a range of Glenn Lucas Signature Woodturning Tools was launched by Craft Supplies USA. From early childhood I have always loved to assemble things. When I was 8 or 9 and no longer satisfied making airplanes out of toothpicks, my father, at my persistence, relinquished the use of his electric jigsaw to me. After a few minutes of instruction and a safety comment (Don’t cut yourself!) I was off cutting various patterns in scrap wood. I was hooked from that point, wondering what could be created with wood. My father is a general contractor and also a wheat farmer. He is one of those people who relies mostly on his own abilities, determination and creativity to repair almost anything that is broken. Growing up watching him build, fix, and create with his hands showed me what is possible with creativity and determination. These skills I learned in my youth helped me to hire on with a construction company as a concrete form builder and cement finisher. For several years I made and set forms and poured hundreds of thousands of yards of concrete. My desire for less concrete and more creative woodwork landed me in a production cabinet shop. I soon became shop foreman. While working at the cabinet shop I noticed an old Shopsmith lathe sitting in the corner. This was the very same vintage machine that my dad owned and let me use to turn wood during my high school years. 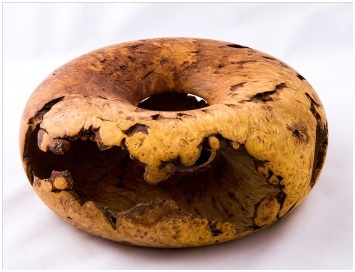 I purchased it, which began my addiction to woodturning. Through a magazine article I discovered segmented turning. All I could think about was gluing wood together and turning on the Shopsmith. This passion consumed my every spare moment. Several years later I started my own custom cabinet business. Operating as a one-person shop, I always had plenty of work and the business prospered. However, I had an intense desire to spend more time turning wood. 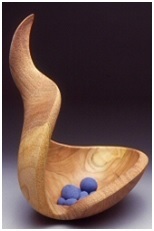 In January of 2002, with the encouragement of my wife Wanda, I began work as a full-time studio woodturner. My current body of work is influenced by life experiences, events, challenges and observations I experience in the world around me. I am motivated by the passion for assembly, creativity, and determination that I learned at an early age. The technical challenges I create for myself in working from vision to art provide great satisfaction. Having lived my entire life near the Pacific Ocean, the motion and rhythm of the ocean's waves are a major inspiration for my work. 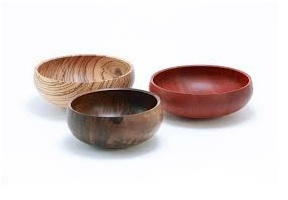 Contrast is also an important element for me, not only aesthetically but in the process of turning a functional object, like a bowl, into an “objet d’art.” Artistically, I like to combine multiple woods with dyes and textures to enhance the rhythmic lines that are a part of my work. 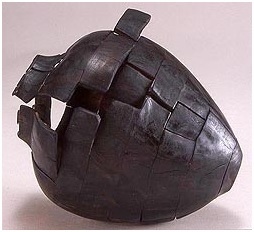 The technical genesis of these works lies in my ability to deconstruct and reconstruct a turned vessel in a number of different ways while maintaining grain and wall alignment. I hope that my pieces will evoke a feeling of movement and energy in an otherwise static environment. 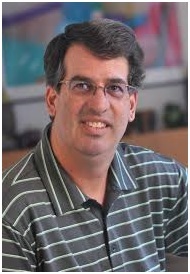 I live in Pacific Palisades, CA with my wife Candy, and two wonderful daughters, Lauren and Rachel. When I’m not turning I enjoy Golf, Paddle Tennis, Skiing, Cycling and Bocce. 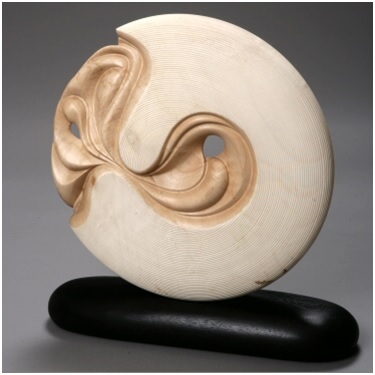 Betty Scarpino's wood sculpture combines fluid motion with intricate detail. Her creative energy draws people to her, and numerous awards have come her way. Scarpino was born in 1949 in Wenatchee, Washington, USA. Her career began in the seventies, when she produced purely functional pieces. 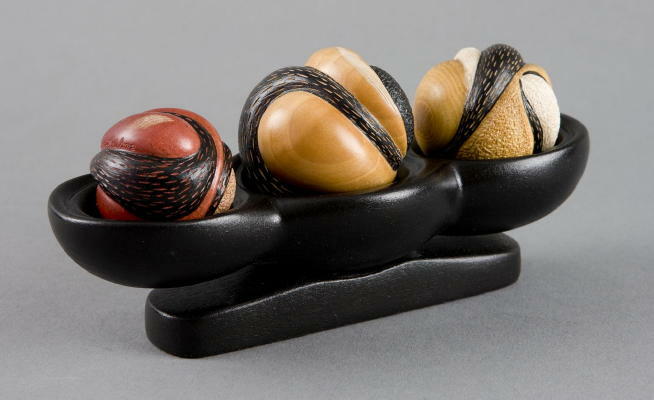 While these early years did not develop artistic innovation, Scarpino mastered the techniques that now create her sculptural and non-functional pieces. 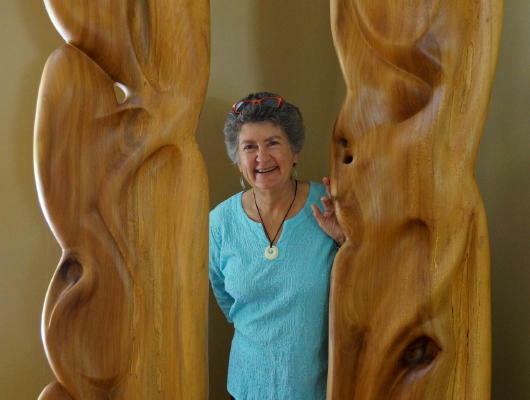 She has a degree in industrial arts from the University of Missouri where she also studied wood sculpture. Scarpino works full time as a sculptor, writer, teacher, and printmaker. Her work is offered for sale in many fine art galleries throughout the United States. "I like ambiguities and use them often in my work...."
"In any endeavour, there's always the unknown: how will things turn out? Even ostensibly positive beginnings contain possible disaster." 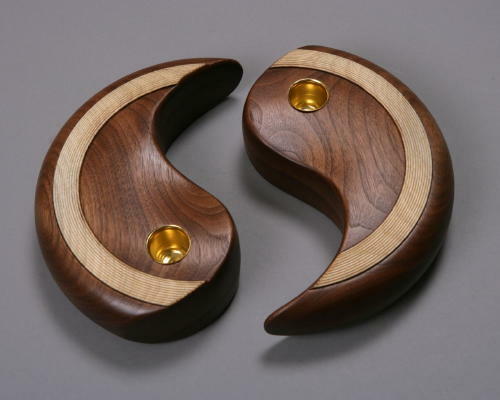 "I have been working with wood for over thirty years, arriving at woodturning from a background in industrial arts and wood sculpture." My work has focused on the use of surface enhancements that employ botanical motifs. Some of the botanical inspirations are obvious. For example, I sometimes use a botanical print motif to illustrate various flowering stages of a particular plant, or I'll cover one of my turnings in maple or oak leaves. Other designs are less obviously botanical unless one is used to seeing plants at the microscopic level. I sometimes enhance a turning by carving a textural motif inspired from cellular structures of plants. Most recently, I have been carving botanical designs into my turnings in 3D. 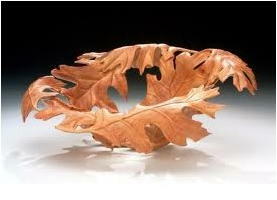 I'm especially fond of maple and oak leaf designs for my carved vessels. My goal is to emulate the work of Grinling Gibbons -- the master carver from the 17th and 18th centuries. Experimentation is part of my design process. I view wood as a medium for exploration and not just a material that has a pretty grain pattern. I tend to use woods that are fine grained with subtle figuring so that my botanical designs become part of the whole vessel, complementary to the wood as opposed to a distraction to the eye. My goal is to enhance the surface so that the vessel becomes a three dimensional canvas that entices the viewer to explore all aspects of the piece. My designs are carved using several different rotary carving tools (e.g., Foredom SR, Foredom Micromotor, and Powercrafter) or via a burnt relief technique I developed using pyrography equipment. 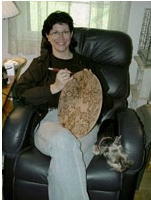 Texturing via carving and pyrography are common elements in my work as is the use of color. Rex Burmingham was born in Springfield, Massachusetts and reared in Bountiful, Utah. He worked as a carpenter for four years after completing high school. He later attended Brigham Young University on an athletics scholarship for football. 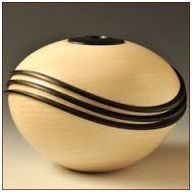 While at BYU, working on a degree in technology education, Rex was introduced to woodturning by Dale Nish. During this time he also worked at Craft Supplies USA, a woodturning supply catalog, as an assistant in the woodturning courses. Working alongside some of the world's best-known woodturners, including Dale Nish, Rude Osolnik, Richard Raffan and Ray Key, gave Rex the chance to learn from the best. After completing his degree, Rex taught woodworking and drafting for three years at East High School in Salt Lake City, Utah. 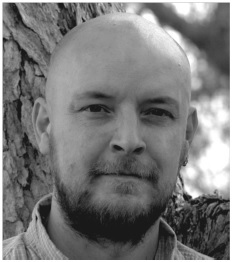 His work has been published in several magazines and is co-author of the book Turning Pens and Pencils. 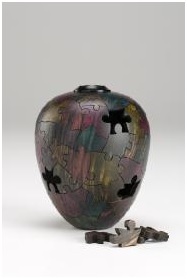 He is currently displaying work in several galleries and participates in several exhibitions each year. 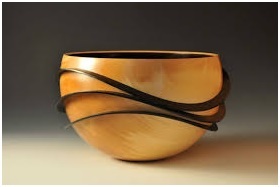 Rex is a nationally recognized woodturner, teaching and demonstrating throughout the United States. 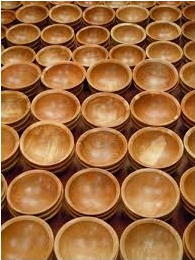 He has given many national and several international presentations at workshops, conferences, and symposia including the American Association of Woodturners National Symposium, the Alan Batty Woodturning Symposium (UK), the Rocky Mountain Woodturning Symposium, the Utah Woodturning Symposium, Craft Supplies USA, Georgia Woodturning Symposium, and John Campbell Folk School of Arts and Crafts. Currently, Rex is Vice President at Craft Supplies USA. 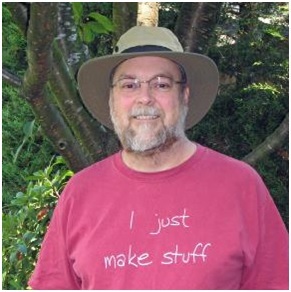 While working for Craft Supplies USA he has the opportunity to research and develop many of the pen kits and woodturning accessories offered today. The combination of his woodturning skills and his love of research and developing woodturning products make him feel like a kid in the candy store! Rex and his wife Laurie live in Highland, Utah, and are the parents of three children. I was born and raised in Kansas, but I have now lived in the suburbs of Vancouver, BC for more than half of my life. My day job (as a University professor) keeps me busy and provides lots of stimulation, but I turn to making wood art whenever I can spare the time. Although I had a brief and unimpressive exposure to woodworking in a junior high school class, I began working with wood more seriously when I was a graduate student. At that time, I was interested in designing and making experimental musical instruments. After moving to BC, I fell in with a rough crowd at the local woodworking club. One of the most interesting things that the club did was to hold an annual 2x4 challenge in which members were challenged to make something using only an 8 foot long 2x4, glue, and finishing products. One of the 2x4 projects that I decided to make was an automated programmable xylophone. It needed some roundish parts which was a good enough excuse to add a new tool to my small arsenal -- the lathe. While completing that instrument, I quickly discovered that turning wood on the lathe was quite addictive. 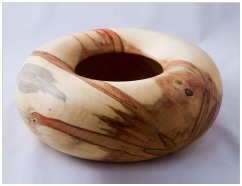 At that point, I began to focus on woodturning rather than instrument building. 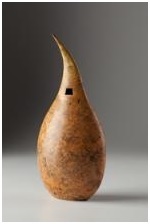 I spent a few years making the usual functional turned items, but a demonstration by Frank Sudol opened my eyes to the possibilities of expression in artistic woodturning. 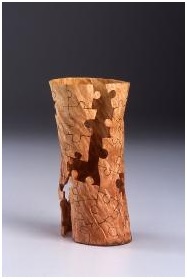 After taking a particularly illuminating class with Jacques Vesery, I starting making my puzzling illusion vessels. Since then, my life in wood art continues to evolve. In addition to the puzzling illusion, I've enjoyed exploring other surface enhancements using pyrography, carving, and coloring. 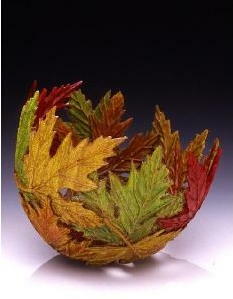 I have a particular interest in making pieces on the lathe that do not necessarily appear to be turned. 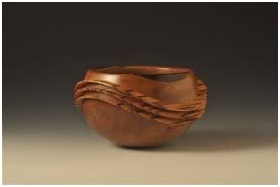 I'm not opposed to working off of the lathe, but virtually every piece that I make is based on a turned form. 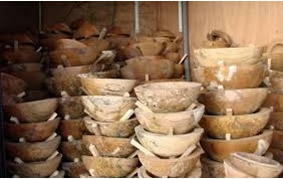 I have demonstrated at many national and regional symposia, as well as for dozens of local woodturning clubs. I have also taught week long courses at the John C. Campbell Folk School and at the Arrowmont School of Arts and Crafts as well as some single day classes for local clubs. My work has been seen in numerous exhibitions and is available through galleries across North America. I have been turning for more than a decade, heavily involved with the Arizona Woodturners Association since 2006 as a club officer (6 years), including president for the last 3 years. I was the local liaison for the Phoenix symposium and have been an integral part of the organizing committees for the Desert Woodturning Roundup since 2009. My relatively young age (36) among many woodturners allows me to represent the next generation.